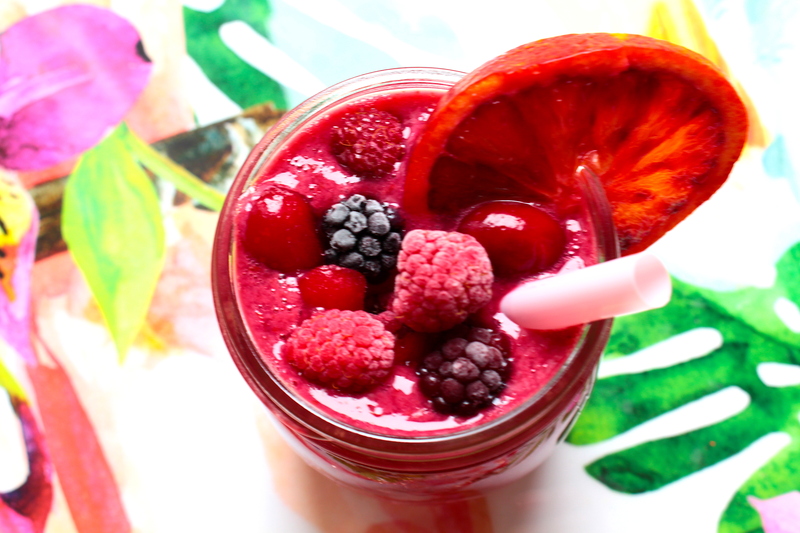 Boost your energy levels with this fruity “Triple-Berry Smoothie”. In addition to their wonderful sweetness, berries are among the healthiest foods on earth! Loaded with antioxidants, the small fruits are the perfect brain food & anti-aging protectors! Did you know? Studies have shown that berries keep your brain sharp! The high antioxidant levels in berries can reduce the aging process of your body (including skin & brain functions). Pour the apple juice into a blender. Add the frozen mixed berries (Raspberries, Blackberries & Blueberries). Add a plash of buttermilk, sweeten with some agave syrup and blend everything in the mixer. Pour the smoothie into beautiful glass jars and top with fresh or frozen berries. Posted in Food and tagged anti-acing, antioxidants, berries, berry smoothie recipe, Berry-Smoothie, blackberries, Blueberries, healthy, raspberries, smoothie. Bookmark the permalink.